Nintendo’s Digital Event video presentation for E3 2015 might be only a couple weeks away, but Nintendo is jumping at the chance to get started early on some of its new announcements. A special Nintendo Direct Micro video is now live, and is not short on new reveals and further details about previously announced Wii U and Nintendo 3DS games. If you don’t want to spoil any of the fun surprises for yourself, stop reading now and watch the full 17-minute video presentation in its entirety. Chibi-Robo! : Zip Lash – Everyone’s favourite little robot is back, this time in a side-scrolling action game! In Chibi-Robo! : Zip Lash, Chibi-Robo must swing his plug to whip enemies, reach far-off platforms and solve environmental puzzles, as well as collect upgrades to extend his plug for getting hard-to-reach collectibles and uncovering hidden areas. Chibi-Robo! : Zip Lash will launch exclusively for the Nintendo 3DS family of systems this October. Dr. Mario: Miracle Cure – The classic Dr. Mario puzzle gameplay that players have grown to love over the years returns in this new game, but with the addition of a game-changing new Miracle Cure item. This cure-all item activates a variety of capsule- and virus-eradicating powers. Dr. Mario: Miracle Cure is available for pre-purchase beginning today and writes a prescription exclusively in the Nintendo eShop on Nintendo 3DS on June 11. LBX: Little Battlers eXperience – Just like the popular anime and toy line, LBX: Little Battlers eXperience lets players build, customize and battle robots using more than 130 models and more than 4,000 in-game parts. Up to six players can connect via local wireless to battle it out and see whose robot emerges victorious when the game launches on August 21. Puzzle & Dragons Z + Puzzle & Dragons Super Mario Bros. Edition – Fans that have already been enjoying the wealth of content in Puzzle & Dragons Z + Puzzle & Dragons Super Mario Bros. Edition are about to get even more! In addition to two extra free unlockable worlds in both the Puzzle & Dragons Z and Puzzle & Dragons Super Mario Bros. 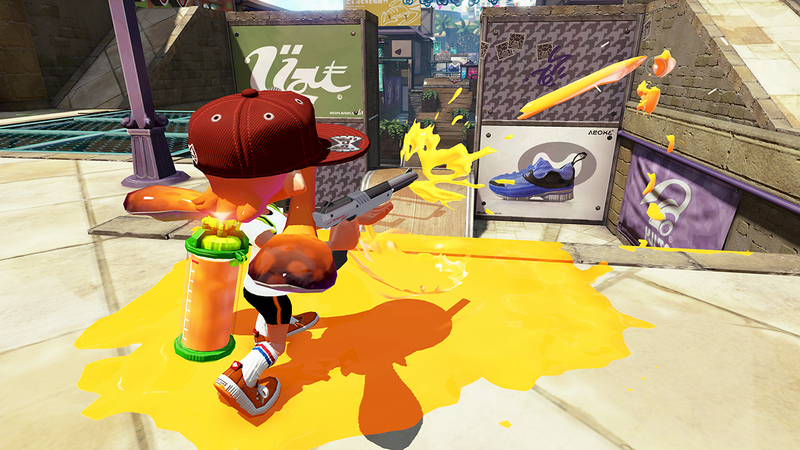 Edition games, players can now start enjoying free weekly online distributions exclusively for Puzzle & Dragons Z.
Splatoon – Kicking off a series of free content additions throughout the summer, Splatoon will be home to a new weapon and map … as of 7 p.m. PT today! The nostalgia-packed N-Zap ’85 rapid-fire Shooter weapon and Port Mackerel map take the gameplay and strategy depth to new heights. Alongside these additions, Splatoon’s Ranked Battle mode will also become available for characters level 10 and above. Art Academy Home Studio – In this new application for Wii U, artists of all skill levels can take lessons, draw inspiration from 360-degree landscape photos and share their creations with friends. Art Academy: Home Studio will even allow fellow art enthusiasts to upload time-lapse replays of their creations to their YouTube accounts. Art Academy: Home Studio is now available for pre-purchase and launches exclusively in the Nintendo eShop on Wii U on June 25. Project Treasure – A new trailer highlighting gameplay in this four-player co-op action game from Bandai Namco Entertainment was revealed alongside the Nintendo Direct video and can be viewed separately on YouTube. Take down enemies, evade traps and escape with spoils from the deepest of dungeons. Mario & Sonic at the Rio 2016 Olympic Games – All of your favourite Mario and Sonic characters are ready to join the fun in Rio, host of the Olympic Games in August 2016. Take the rivalry on the road with super-charged Olympic events like Soccer and Table Tennis in the Nintendo 3DS version, or see if you’ve got what it takes to hang with the best in the Wii U version, with events like Soccer, Rugby and Beach Volleyball. More details about the games will be announced in the future. This entry was posted on Tuesday, June 2nd, 2015 at 4:17 pm and is filed under Action Adventure, Casual, Digital Products, Events, Everyone, Everyone 10+, Mobile, National News, New Releases, Platform, Puzzle, RPG - MMORPG, RTS, Simulations, Social Media, Sports, Teen, Upcoming Releases. You can follow any responses to this entry through the RSS 2.0 feed. You can leave a response, or trackback from your own site.